This package encapsulates all the software necessary to capture, display, and upload telemetry data from CSSWE in real time! 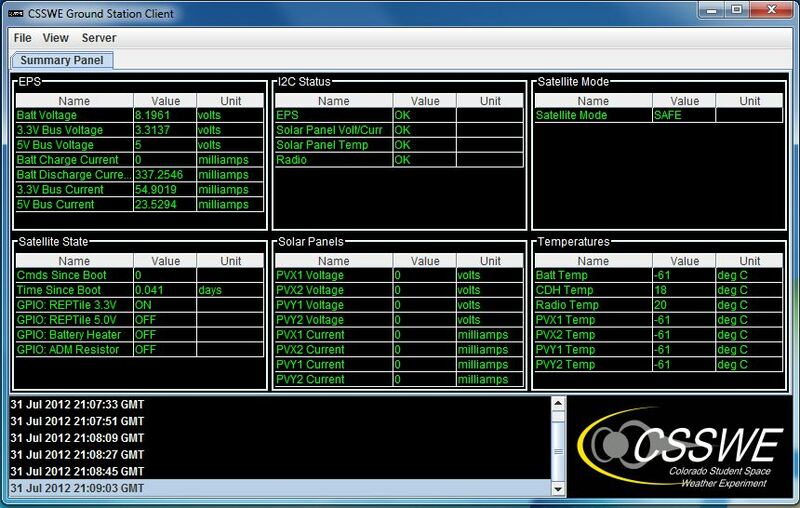 This software package was created by Ben Kempke at the University of Michigan, and is based off of a similar package used to decode beacons from the RAX2 CubeSat. All software has cross-platform capability. All that is required is a computer running Windows, Mac OS X, or Linux with serial port access to a TNC. The following installation instructions assume that the connected TNC has already been configured to run in KISS mode with the proper serial baud rate and port set. NOTE: The following software does not automatically configure the connected TNC for KISS mode. Please refer to your TNC’s user manual for instructions on configuring it to run in KISS mode. The serial port forwarding software requires Python 2.5 or later. Python is free to download: Python.org. Python is also available for many Linux distributions, check your Linux package manager for details on installing Python (e.g. sudo apt-get install python for Ubuntu). Although installation is essentially the same, there are some minor differences between installing on Windows and Linux-based platforms. Extract csswe_public_gs_dist_v2 (version 2, updated June 2013) into the newly-created directory. Navigate to the GS software directory in Windows Explorer and double-click on setup_pyserial.bat. This installs serial drivers so that Python can connect to the serial-based TNC. A command prompt will appear. Verify that no errors have occurred. specifies the TCP port to open communications with either a local or remote client. This will be referenced when configuring the beacon decoding client. specifies a radio-specific identification for this radio in the log files. Please change to describe your radio. Save run_serial_to_tcp.bat and exit the text editor. Double-click on run_serial_to_tcp.bat. A new window will appear. If everything is working correctly, it should display “Waiting for connection on 12500…”. The beacon decoding client software requires Java. Java is also free to download: Java.com. Navigate to the GS software directory in Windows Explorer. Then open the /CSSWE_GX_Client/ folder. specifies an uplink port to relay data on to our servers (e.g. 12501). If you would not like to open a port for uplink, set this to 0. Double-click on run_gs_client.bat. A summary window should pop up displaying all of the relevant datapoints. Now you are ready to start receiving beacons! When the TNC receives a valid packet, it should be relayed to the beacon decoding client, displaying live telemetry points to your screen! This installs serial drivers so that Python can connect to the serial-based TNC. Verify that no errors have occurred. Save run_serial_to_tcp.sh and exit the text editor. Type ./run_serial_to_tcp.sh. If everything is working correctly, it should display “Waiting for connection on 12500…”. Like Python, Java can also be installed as a package. Check your distribution’s package manager for details on obtaining the JVM. Common packages are openjdk-6-jdk and sun-java6-jre. Navigate to the GS software directory in Windows Explorer. Then open the ~/CSSWE_GS/CSSWE_GS_Client/ folder. Type ./run_gs_client.sh. 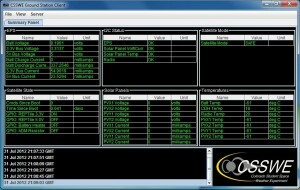 A summary window should pop up displaying all of the relevant datapoints. The CSSWE beacon decoding software package is provided by the University of Colorado “as is” and “with all faults.” The University of Colorado makes no representations or warranties of any kind concerning the safety, suitability, lack of viruses, inaccuracies, typographical errors, or other harmful components of this beacon decoding software package. There are inherent dangers in the use of any software, and you are solely responsible for determining whether this beacon decoding software is compatible with your equipment and other software installed on your equipment. You are also solely responsible for the protection of your equipment and backup of your data, and the University of Colorado will not be liable for any damages you may suffer in connection with using, modifying, or distributing this beacon decoding software package. In downloading and running this software, you agree to accept the risks outlined in this disclaimer.